The MH3 microphone includes a high-quality element, space-saving right-angle plug, PTT switch, and VFO UP/DN function buttons. The KXPD2 is a very compact mechanical keyer paddle that attaches directly to the front of KX2 (or KX3). This eliminates the need for a heavy keyer base. It includes a slot in which to store the contact-adjustment wrench. These padded cases will protect your KX2 and accessories during transport. 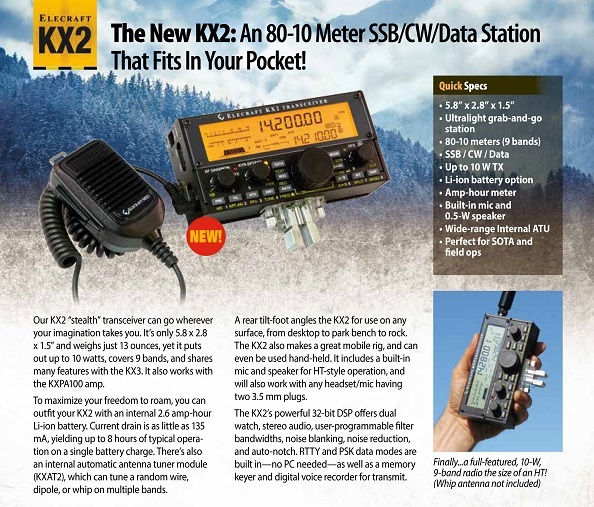 The CS40 is just right for carrying the KX2, a wire antenna, earbuds, log sheet, keyer paddle (e.g. KXPD2), and other small items. The larger CS60 can also accommodate an MH3 microphone and larger antennas or accessories. 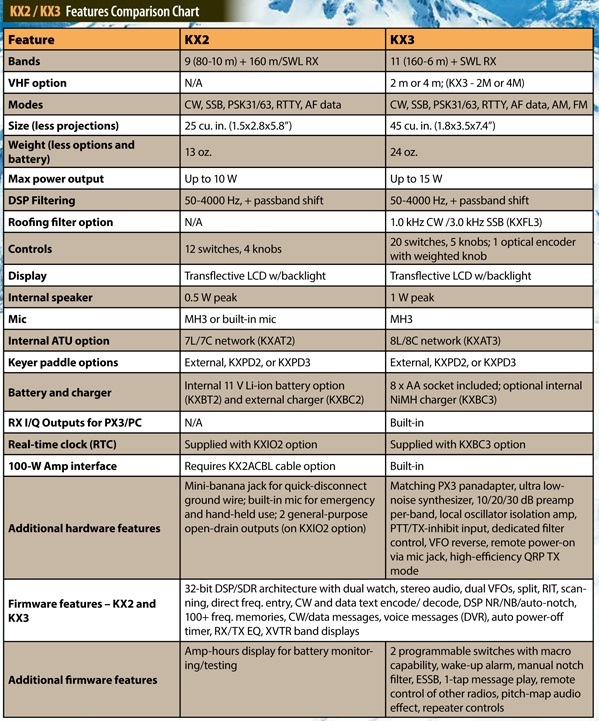 The KXIO2 option provides a real-time clock and two user-programmable outputs (AUX jack). The time can be displayed in the KX2’s VFO B area and the TIME menu entry). Time accuracy can be fined-tuned to about +/- 2 seconds per day using the RTC ADJ menu entry. 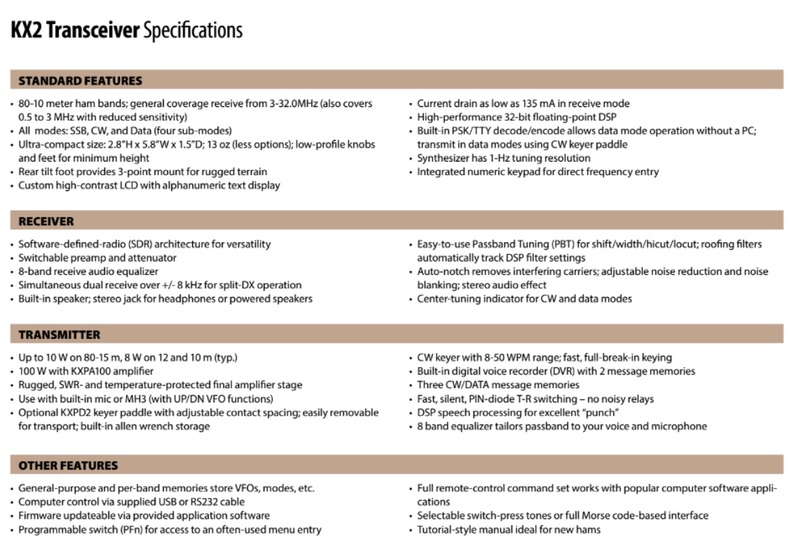 The two AUX outputs can be used for controlling per-band external equipment such as an antenna switch or transverter (see the AUX 1 and AUX 2 menu entries). With a KXAT2 automatic antenna tuner (ATU) installed, you can use non-resonant and narrow-band antennas. Such antennas are very convenient for field operation. An ATU can improve transmit power transfer and receive sensitivity. 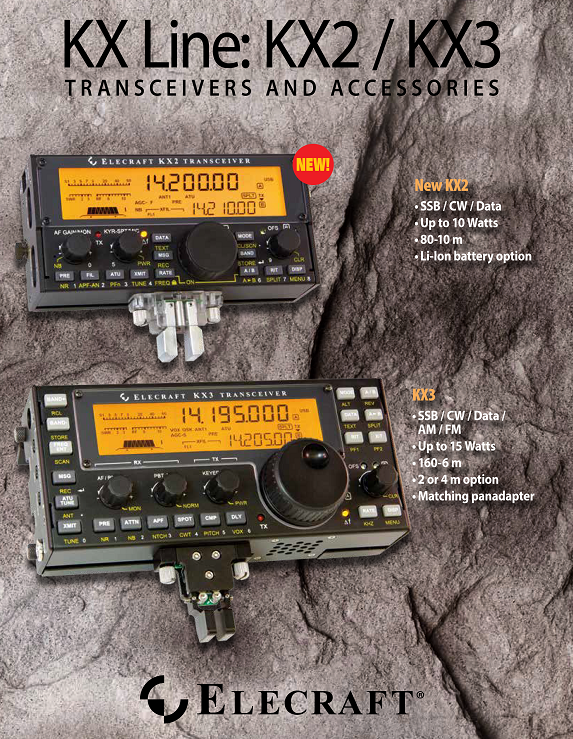 The KXPA100 is a rugged 100-W, 160-6 m amp that can be used with the KX2, KX3, or any other QRP transceiver. An internal 100-W ATU is also available for the amp (KXAT100). 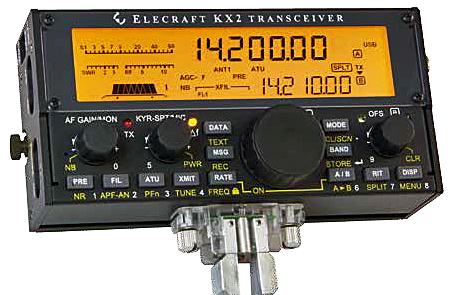 The KX2 can remotely tune the 100-W ATU and control its antenna switch ( MENU:ANT.X SW). A KX2 Accessory Cable (KX2ACBL) is required to split the KX2’s ACC jack into two jacks: KEY OUT (2.5 mm) and serial I/O (3.5 mm). A mini-banana plug intended to facilitate ease of grounding on the KX2. signals separately. These can then be connected to an Elecraft KXPA100 amplifier via its adapter cable.